This is a story about one of the most amazing things I have ever seen. It involves Revelation chapter twelve and the following verses. This incredible event will take place on Sept. 23 of this year. If you recall back in 2014 and 2015 there were four astronomical events that took place in the heavens over a 12 month period. These events are called “blood moons” or tetrads. A blood moon is a total lunar eclipse. It is called a blood moon because at its fullest stage of “eclipse” the moon turns red. The fact that four total lunar eclipses would occur in a twelve month period is itself, extremely unusual, so unusual that this has happened only seven times in all recorded history! But wait, that’s just the beginning. These four events landed on the Jewish holy days of “Passover” and the “Feast of Trumpets.” That is, Passover and Trumpets on 2014 and again, Passover and Trumpets in 2015. Is God trying to tell us something important? 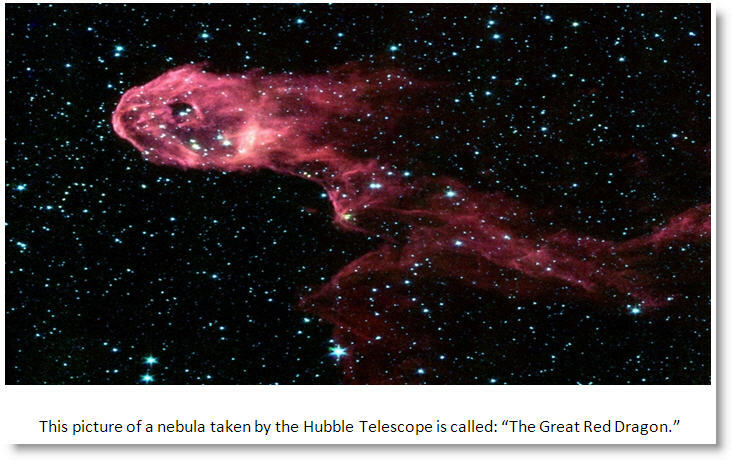 First, our Lord and Creator has planned from the very beginning to use SIGNS in the Heaven as “harbingers” or signals to GRAB our ATTENTION that something BIG and MIGHTY is about to happen. Since two of the dates were the Feast of Trumpets, one could speculate (as I have) that the rapture of the church is about to happen. The other two dates were on Passover. Since Passover is strictly a Jewish event (no Gentiles allowed), I believe it will bring on the Great Tribulation which God uses to bring the Jews to salvation. (See Romans 11:26, 27 and Revelation chapter 7). As mentioned at the beginning of this article, the exact thing being described in Revelation 12 will occur on Sept. 23, 2017!!! No agnostic or atheist can deny this event because it will happen in the heavens just as prophesied. You see, during the 24 hour period that makes up one day and that day being the 23th of Sept. the constellation Virgo (Virgin) will have the sun behind her (“clothed with the sun”), the moon will be “under her feet,” and “twelve stars” will make up her crown! But wait, there’s more. 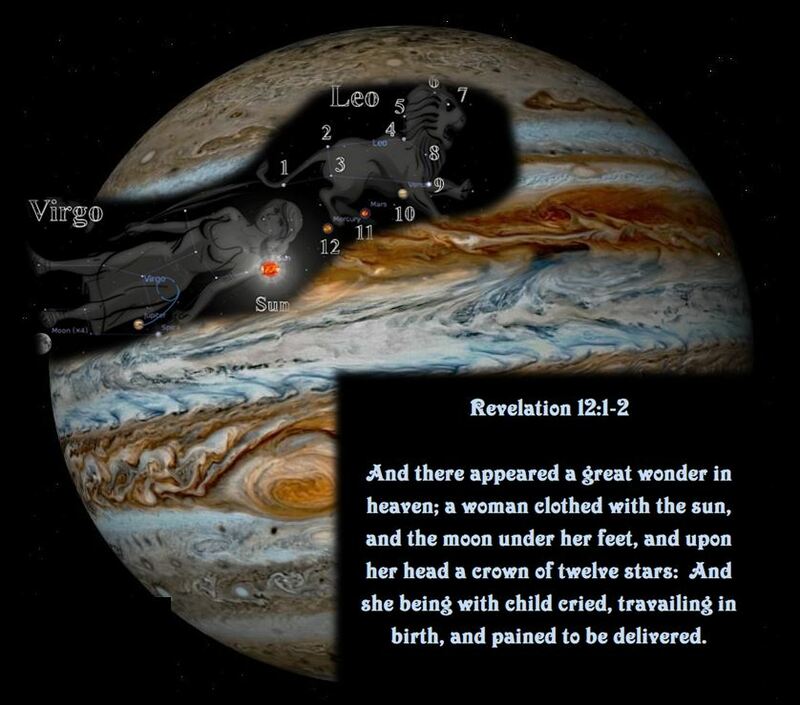 The planet Jupiter will be in retrograde motion inside the womb of the virgin. It is there right now and has been for a little over eight months. It will finally move out of the womb of the virgin on 23 September, after having spent nine and a half months in her womb. 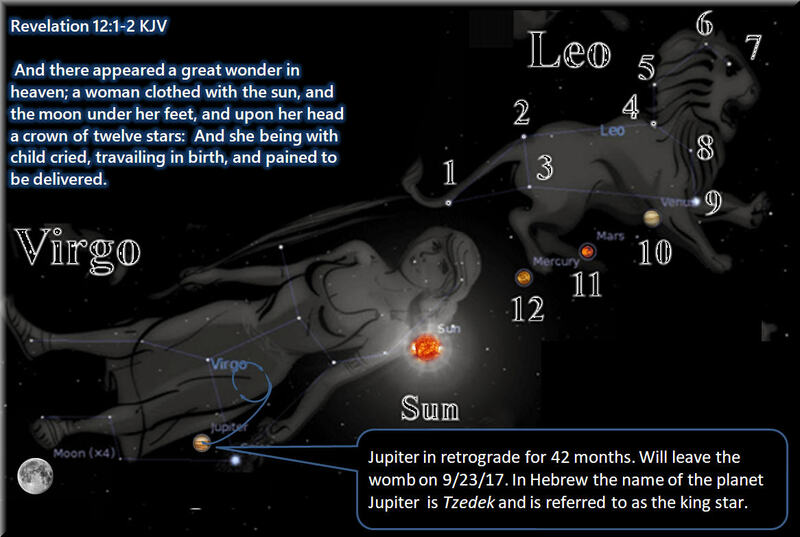 The planet Jupiter is known as the King Star and the Hebrew name for the planet is Tzedek = צדק. The meaning is justice and also righteousness. So you might ask yourself, how often does this alignment occur? The answer is never! It has never happened in recorded history and using a computer generated celestial alignment chart, it would have happened 7,000 years ago. According to creation science and using their dating methods 7,000 years is when the earth was created by God. But wait, there’s more. “She (the virgin) bore a male Child who was to rule all nations with a rod of iron. And her Child was caught up to God and His throne.” Revelation 12:5. The Greek word for “caught up” is “harpazo,” and it’s only used twice in the Bible. The other time it’s used is in I Thessalonians 4:13-18 where Paul describes the rapture of the church: “But I do not want you to be ignorant, brethren, concerning those who have fallen asleep (died), lest you sorrow as others who have no hope. For if we believe that Jesus died and rose again, even so God will bring with Him those who sleep in Jesus. Christians have Christ living in them: “To whom God would make known what is the riches of the glory of this mystery among the Gentiles; which is Christ in you, the hope of glory.” Colossians 1:27. Just as the stars and planets making up a pregnant Virgin in the sky are symbolic and point toward a momentous event, so also is the fiery red dragon who casts a third of the stars to the earth a symbol that points toward a horrific event! This is a great time to be alive if you’re a Christian because we are the ones that will see the culmination of the ages played out. It will be these Christians who will never die because the rapture of God’s church will remove them from earth just prior to the tribulation event. Editors Note: To be clear, this article is not stating that the rapture will occur on 9/23/17. No one knows the day or hour… it could occur at anytime! Are you ready? May God bless you as you seek Him out through prayer and study of His Word, The Bible! Want to know more? Please check out A New Life In Christ! Tagged 9/23/17, America in prophecy, Biblical feast, Blood Moons, end times, endtimes, Feast of Trumpets, Jesus Christ, judgement, Jupiter, Last days, Left Behind, Leo, Passover, Prophecy, rapture, Repent, Revelation 12, tetrad, Tribulation, Tzedek, Virgo. Bookmark the permalink.